"SEEK" is a national conference hosted by the Fellowship of Catholic University Students (FOCUS). This year's conference, being held right now in Nashville, is a sight to behold. This morning, at a Mass offered by Archbishop Charles Chaput and maybe two hundred priests, approximately 10,000 college students and seminarians worshipped God. It is encouraging to look around and see the evidence of Christ. For the few people who are staying at the hotel who are not participants in the conference, they must be amazed. 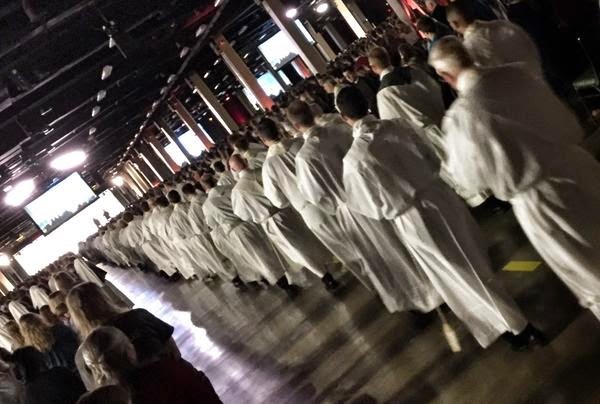 The convention center complex is filled with 10,000 joyful young Catholics. Every where you look, there are joyful, young nuns engaging in conversation with students. There are priests and religious brothers everywhere. It is difficult to walk anywhere in the convention center without some young person asking, "Father, can you hear my confession?" While I am happy to be with all of these young people, what has been most fruitful for me is the time spent with brother priests. It is edifying to encounter so many good priests who are doing so much great work in the life of the Church. The opportunity to gather with such great priests is helpful to me in my life. Firstly, it is helpful because I can learn from them. Some of them have been in campus ministry for years and can offer sound counsel. Secondly, it is helpful to my life because it is just encouraging to see how Christ is working in and through these men. Seeing what God is doing through them makes me grateful to be in their company. At the heart of all of this, however, is Christ. Where Christ is present, there is joy. Written all over the faces of the priests, religious, seminarians, FOCUS Missionaries, campus ministers, and university students here is joy. This joy is not something one can stir up on his own or by command. It is a joy that comes from an encounter. As I look around, something very simple strikes me: As a Church, we should do what works and we should focus our attention and resources on the places where they produce fruit. Sometimes, in the life of the Church, we are our own worst enemies. We repeatedly attempt to implement things that will never be fruitful. But, where there is fruit, we let it die on the branch. A good example of this would be the religious orders of women who are present at this conference. They are young, joyful women! Many religious orders have grown old and tired. They produce almost no young vocations. As a Church, perhaps we should look at the orders that are producing vocations and say, "What are they doing right? How do we help them and encourage them?" Similarly, what college campuses around the country are filled with young people who love Christ and who are on fire for the Gospel? What are they doing and how can we imitate them? What dioceses are exploding with vocations? In what parishes are there lots of people going to confession? What religious orders are flourishing? Where are there conversions happening? Where are young people going to Mass? As I look around the convention center, I am aware of something. There are things that work! They work, of course, because they have Christ at the center. We shouldn't waste too much time trying to make stuff that hasn't worked, work. We should jump on the bandwagon of joy and invest ourselves in what is clearly working. Oh how to get more young people at Mass. We recently canceled pizza night a few months ago due to lack of attendance but now there doesn't seem to be anything on the horizon for young adults. I don't know that it's helpful to consider trying to just help 'young people' as a population. You should get to know people's names and their stories. Build up friendships. Shine with joy from encountering Christ. That is enough. Good advice but at our parish, getting to know their names and building friendships has been spotty at best because there is a big disconnect in our parish. I have seen first hand how those in spiritual need have been brushed aside. Our failed pizza night seems to be a symptom of long-standing neglect. Yeah, sorry to hear that things are rough! It's pretty common to feel that kind of disconnect. I've found that breaking away from the mindset of 'holding events' to simple one-on-one introductions and friendships is super effective. Events may need to become the fruit of many friendships! I will pray for your parish! "As I look around the convention center, I am aware of something. There are things that work! They work, of course, because they have Christ at the center. We shouldn't waste too much time trying to make stuff that hasn't worked, work. We should jump on the bandwagon of joy and invest ourselves in what is clearly working." I love this bit. This is so awesome and on point! Humility is the key that opens the door to real joy!